Find your forever friend at Super Adoption. 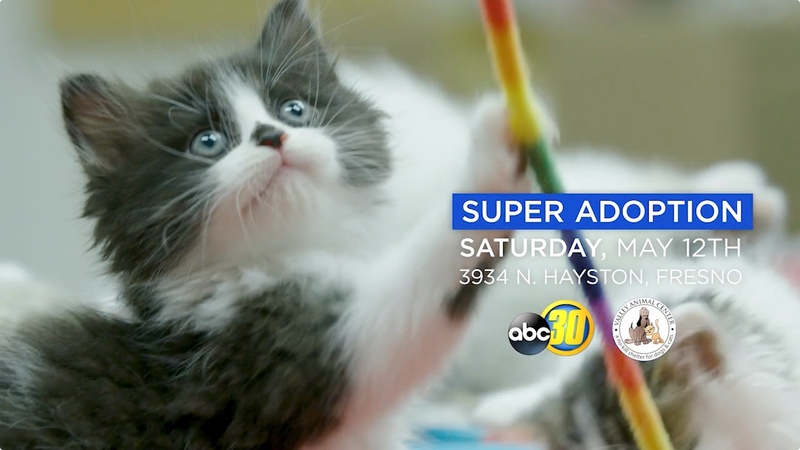 ABC30 and Valley Animal Center invite you to this year's Super Adoption. Join us on Saturday, May 12, from 9am - 2pm, at the Valley Animal Center located at 3934 N. Hayston Ave.
ABC30 Action News reporter and weather anchor Brianna Ruffalo will emcee this year's event. Super Adoption brings together multiple local rescue shelters for the largest adoption event in the Central Valley. Hundreds of dogs and cats will be available for adoption. And if you already have a home full of pets, we have a variety of family friendly activities to enjoy including a kids zone with face painting, doggie demonstrations, food vendors, a photo booth and a pet-vendor faire. Don't miss the fun! Join us at Super Adoption.